ReDAQ® Shape is Dataforth’s out-of-the-box Data Acquisition Software package. ReDAQ® Shape software ensures an exceptionally powerful Data Acquisition System. 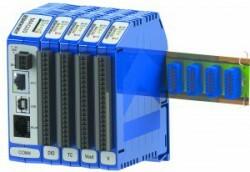 Dataforth’s DSCA modules are Din Rail mountable Signal Conditioner Modules encompassing a wide selection of isolated analog input and output functions. Analog inputs include voltage and current in narrow and wide bandwidths, Thermocouple, RTD, Accelerometer, Potentiometer, Strain Gauge, Frequency, and 2-wire Transmitters. More than 250 different 5B modules are available encompassing a wide selection of isolated analog input and output functions. Analog inputs include voltage and current in narrow and wide bandwidths, Thermocouple, RTD, Accelerometer, Potentiometer, Strain Gauge, Frequency, and 2-wire Transmitters. Each SCM7B module provides a single channel of isolated analog input or output. Various input modules accept analogue voltage or current signals from all types of field sensors and sources, filter, isolate, amplify, linearize, and convert these input signals to high-level analog outputs suitable for use in a process control system. Dataforth’s new SensorLex® 8B line of isolated analog Signal Conditioners provides 19 family groups with a total of 123 Models that interface to a wide variety of Voltage, Current, Temperature, Position, Frequency, and Strain measuring devices. Housed in a package only one-fifth the size of competing products, the 8B offers fully functional Instrument Class® performance with superior specifications such as ±0.05% accuracy, ±0.02% linearity, 5-pole filtering, 1500Vrms isolation, low output noise and much more. 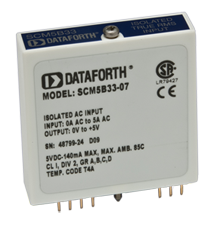 Dataforth offers high quality SCM9B products providing cost-effective protection and conditioning for a wide range of valuable industrial control signals and systems. 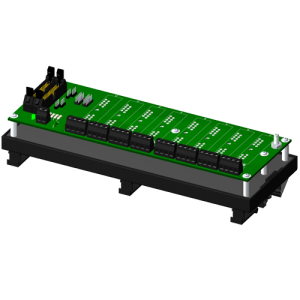 Our extensive line includes fixed and programmable sensor-to-computer and computer-to-analog output interface modules, RS-232/RS-485 Converters, RS-485 Repeaters, and associated backplanes, accessories and applications software.